I have some neuroses. I wouldn’t go so far as to say I have OCD, at least not in the clinical sense, but there are a few things that I strongly do or don’t prefer. I acknowledge they are irrational. I could fill a book, but I’ll stick to broad strokes here. Keep in mind that should any of these situations arise, no one, save the four, maybe five people in my life close enough to me to know, know that something “not good for me” is happening. I rarely (read: almost never) display any outward manifestations of my inner freak-out-edness. But I get uncomfortable. My palms sweat and my heart races, and I feel like I might need a nap. Here are some of the things. I have to eat a probiotic every day. I hate touching (or stepping on) wet things. Cocktails (or any drink that starts not cold) must have lots of ice (which means sweat, which means napkins wrapped around the glass because #2). These last two are important because social morays, logic, and reality all suggest that I’m bananas at the very least and really lazy at best. Or I’m not super smart. But here’s the thing. Even though I hate doing laundry, and I am self-aware and honest about it, I never thought that my waiting until I’d worn everything I own at least eleven times and was out of underwear (I have a lot) before doing laundry was because I was lazy or coconuts or not very bright. I truly believed that it was because I thought washing and drying my clothes was ruining them. It never really came up because I’ve lived alone most of my adult life, and I haven’t always “had it.” When I was still under my parents roof, up until 18, I did not believe that laundering my clothes ruined them. Every night I threw what I’d worn that day into the hamper. Towels used once every morning after a shower? Directly into the washer (why bother with the hamper when they can just make the next load?). I threw clothes into the hamper that I tried on and opted against for that day. Clothes that were on my body for thirty seconds. I also didn’t do the laundry. But this equation never crossed my transom. Eventually I moved away and went to college and then moved a few more times, spent a bunch of years in another state, in the sleepy wild wilderness, moved back to California (my home state) for graduate school, and then landed where I’ve been since, in Seattle. I honestly can’t remember how much laundry I did during those years, but I don’t remember believing I was ruining my clothes by washing and drying them until about twenty or so years ago, which is how long I’ve lived in Seattle. My pattern was this. Wear everything a lot, and then one day, for load on end, wash it all. Then hang most, but dry some items, on the lowest heat setting (my happiest laundry days were the days I had an actual clothes line in the backyard). Then I would drag my heels folding and putting away. This part of the cycle could go on for days or weeks. 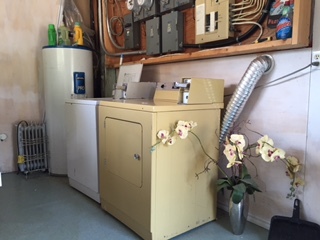 Eventually I met and married Loren, and he does laundry like a normal person (regularly), and it wasn’t until many months, probably more than a year, of sharing a life and a home and a washer and dryer, that one day he asked why there were so rarely any of my clothes in the laundry. Me: “Oh, I just don’t wash my clothes very often.” L: “Why not?” Me: “Because they don’t get dirty. Plus, it ruins them.” And that was that. He is an amazingly open, patient, accepting man. We knew this morning that a storm was coming in, scheduled to arrive sometime this evening, so we pulled up the anchor, untied our lines, and set out. Our destination was Pender Harbor, approximately ten miles north. It was already windy in the bay, and by the time we got out to the strait, it was real-wind windy. Strait of Georgia windy. Day we pulled into Nanaimo windy. But the winds were in our favor, coming out of the SE, so a) we could sail; and b) we could sail in the direction we actually wanted to go. We had the added benefit of the tide going out, so we were riding the flood in addition to the help from the wind. The seas were relatively rough, but we made ~7.5 knots the whole way (I don’t want to get jargonny with the sailing terminology, but that’s faster than we go with our engine, and for sailing it’s fairly fast, especially when the water is choppy). I’m new to sailing. I’ve been doing it approximately 15 months. I’ve learned a lot, and I’m OK skill-wise. What I lack in experience and the kind of intuition and muscle memory that come from doing something so long it’s like breathing, I make up for in strength, will, determination, and, I wouldn’t say fearlessness, but close to it. With less fear that most, maybe. I have juevos, and I don’t like defeat. Something in my makeup or raising limits me from feeling or showing weakness. I’m not saying these things are good or bad or that I like or don’t like them about myself. I wear none of these traits like a badge of honor. It’s simply who I am. I’m drawn to things that challenge me, and I’m wired to see how much I can handle. I’m innately unable to tolerate shying away from anything that involves persistence, adrenaline, and/or the combination of physical and mental toughness. You couldn’t draw a better sport for me than sailing. It requires all of my strengths and demands a list of what I don’t yet possess that would circle the globe many times over. As with anything you’re learning, there are tough patches you conquer–the memory of before [x skill] dissipating almost the second it’s learned–that give way to the tens of hundreds more on the list. And the only way to work the list is to leave your comfort zone. There are myriad arguments about this, I know. If life is meaningless, then why bother with your comfort zone? I see the other side. And I’m happy to discuss ad museum over cocktails. But for me, it’s live this life now. Don’t wait. And live it in the way you want. For me, the way I want is outside my comfort zone a lot of the time. This isn’t to say I don’t like the warm jacuzzi of my comfort zone. Quite the contrary. It has it’s time and place with me, and like an entire Sunday spent in the kitchen, or an afternoon on the foredeck with the sun and a book, I’m very content there. I just don’t tend to stay very long. One of my comfort zones when sailing is being prepared. Books and charts and tables soothe me. I love planning the route, checking the tide and current tables, and calculating weather windows. Prep is anesthesia for me. Another one is being away from land. Being close to land equals rocks and cliffs and shallow water and danger. We draw four to fourteen feet of water, depending on whether our center board is down, and our mast is fifty-five feet high. There are dangerous obstacles when we’re near things. But today our course was safest fairly close to land. It kept us out of rolling waves hitting us sideways. I sailed for a while in the late morning, and then when things got a little rougher, Loren took over. We were very close to land, running before the waves, and getting tossed hard. We were never out of control, and never in danger. Loren is a skilled sailor and would never put us in harm’s way. The only real danger was in my mind (“…blown into the rocks” is a phrase I wish I hadn’t read nine hundred and eighteen times), and I had to sit with it for much of our journey. I got scared, and I said it out loud. But, that was it for outwardly manifesting my freak-out-ery. I concentrated, stayed focused, listened and processed why it was safe. I trusted Loren, learned a little more, and gained immeasurable experience. We safely sailed out of the strait and got to a sheltered marina in the harbor. We checked in, exchanged some dollars for loonies, grabbed a shower, and threw in a load of laundry, all before the storm hit. I washed every single thing I’ve worn since we left home, and I only excluded five things from the dryer. WOW! Talk about deja vu all over again!!! Didn’t we just have that conversation about laundry?? Love the blog, honey!! Sounds like a great day to me. In fact, the whole trip sounds like a great experience. It won’t be long before the scary things become mundane and that is when you should really be concerned. It is good to be scared. Enjoy the adventure. Haaaaaaaaaaaa. Waited for that ending and LOVED it. I waited for the ending and then it LANDED. Haaaaaaa.